Intel put on a dazzling light show at this year’s Super Bowl halftime show (even if it wasn’t live) using hundreds of Shooting Star drones. If it hopes to get invited back (or to other big shows), the chipmaker will need to step its game up as Japanese phone operator NTT Docomo on Tuesday unveiled what appears to be a far superior lighted drone solution. NTT Docomo’s unmanned aerial vehicle is essential a flying, spherical display (and the first of its kind, according to the company). Structurally, it consists of a spherical external frame with an internal LED frame packing eight curved LED strips that extend from top to bottom. 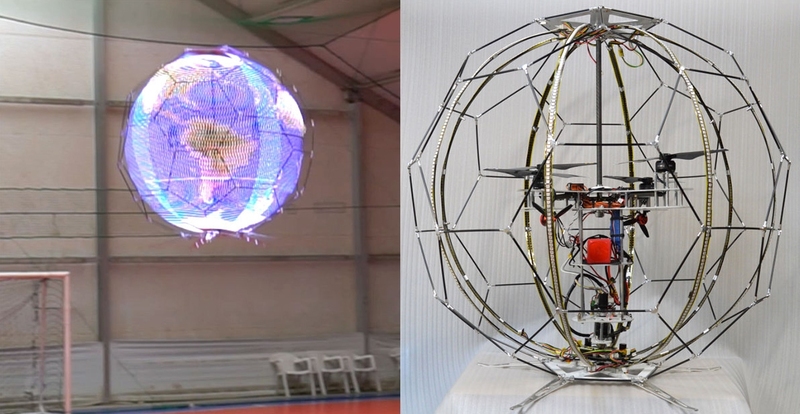 The diameter of the spherical frame is roughly 88 cm (around 34.5 inches) and the entire device with drone weighs just 3.4 kg (a tick under 7.5 pounds). The LED display measures 144 pixels high and 136 pixels wide (horizontal circumference). Inside is a drone with legs protruding from the bottom. While in flight, the LED frame spins rapidly to create the illusion of a solid image (kind of like those circus light toys you may have seen). NTT Docomo says the drone is highly maneuverable and can be operated virtually anywhere such as in concert halls or arenas to display advertising, event information or even as part of a performance. NTT Docomo says it is looking to commercialize the drone sometime in the fiscal year ending in March 2019 so don’t expect to see it anytime soon.